If Hanaya Yohei (1799–1858), the originator of modern-style sushi, caught a glimpse of the long-ranging love affair (dare I say “obsession”?) with sushi in the kosher world, whatever would be his reaction? Be it the unique mingling of umami flavors on the palate or the flavor-packing oomph this one-bite food can deliver, one thing is for sure: after more than two decades of consistent popularity in kosher venues, Jews still love sushi. Once thought of as the unattainable domain of sushi chefs and aficionados, making sushi at home has become more and more common over the years. 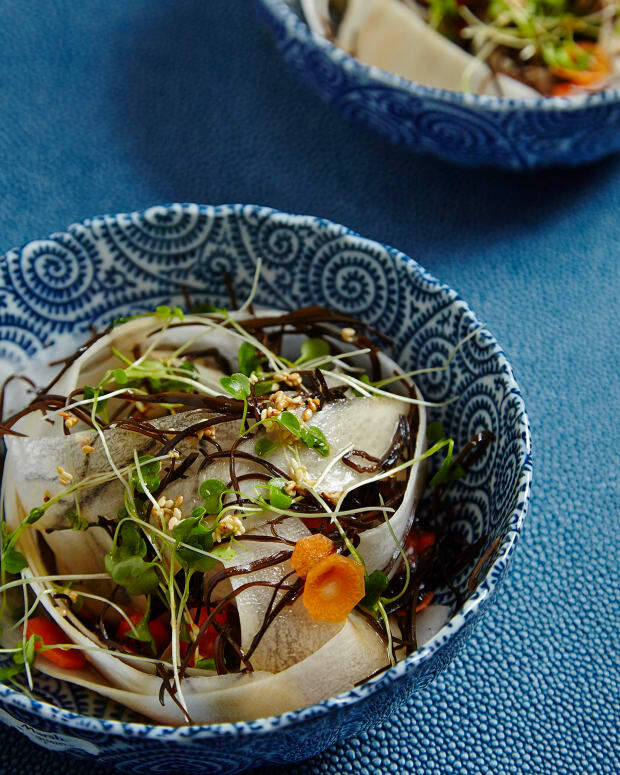 Sushi-inspired dishes like Sushi Salad that are less technique-based than rolling sushi, yet capture its style and taste, have become widespread amongst home cooks. 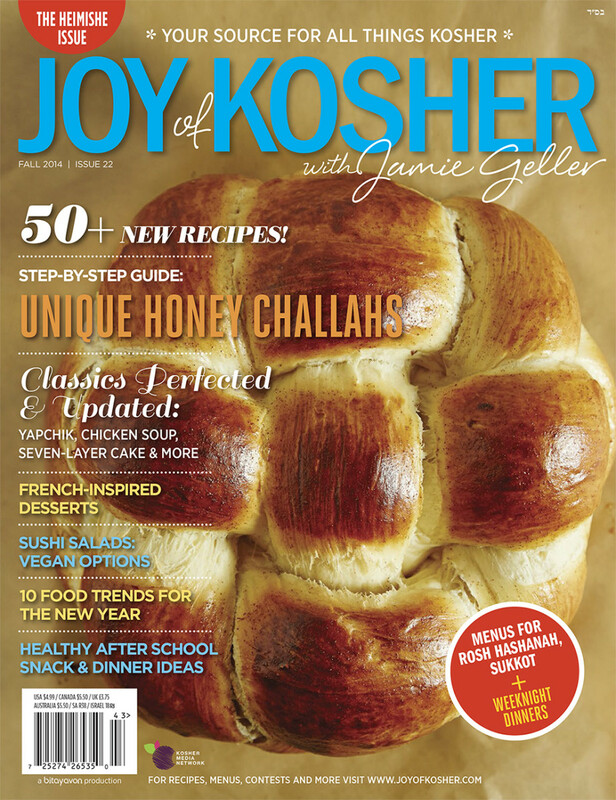 These can be a fun and easy treat, especially on Shabbat or holidays. Knowing a bit about the ingredients, though, is key for success. Sushi is all about and has always been about the fish. Originally, sushi wasn’t a dish. It was a mechanism for preserving fish in the days before refrigeration. Fish were packed in rice mixed with vinegar, which fermented the fish, thus preserving it (the rice was discarded after-wards). Today, sushi chefs in Japan are trained to know not only how to select and cut a huge array of fishes, but also which part of the fish is the most select and suitable for use in sushi or sashimi (raw fish eaten without rice) and which parts are best cooked. 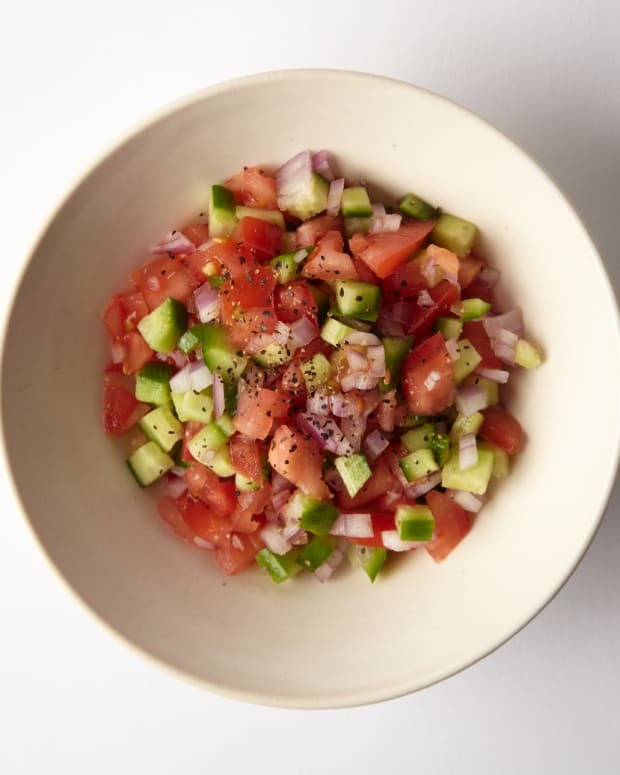 When using raw fish, exercise caution: the fresher the better; the more select the better. When purchasing fresh tuna for sushi, specify that you want “sushi grade” tuna. It should have a moist sheen to it and have no odor. Dry, smelly fish means old fish. Salmon is known to have a greater prevalence of bacteria than many other common species. A professional sushi chef recently recommended to me that if using farmed salmon for sushi, pre-freeze overnight with a pinch of sprinkled salt to kill any bacteria or parasites. 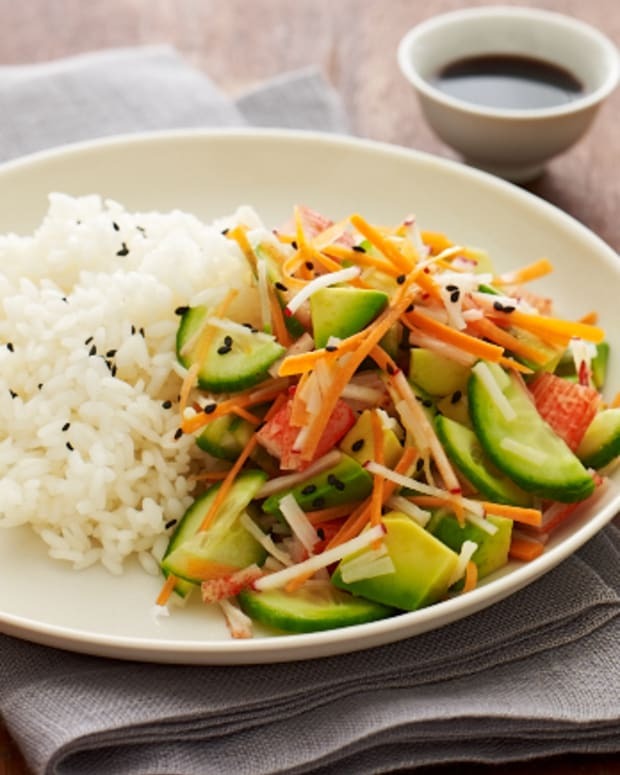 Surimi is a Japanese term for a processed seafood made of finely pulverized fish (usually Pollack and/or other white-fleshed fish) that is cured and shaped to resemble shellfish like crab, lobster, or shrimp. Though Japanese in its invention – a brainchild which reduced costs and maintained avail-ability and consistency in sushi restaurants – surimi mock-crab sticks have provided kosher consumers the opportunity to experience some of the traditionally non-kosher tastes that would have otherwise been off limits. It is also a great choice for those nervous about using raw fish as this is a cooked product. Surimi crab sticks are available in the frozen section of the supermarket. *Allergy note: Surimi is highly processed and may contain gluten as a filler. Always check packages first! As much as sushi is about rice and fish in Japan, sushi in the West is just as much about all the creative fillings and toppings we have dreamed up. If making sushi at home, feel free to experiment; you won’t win any awards for authenticity, but you will have some delicious fun. Combining my love of sushi with some fresh salad ideas makes for great eats...I hope you’ll enjoy them, too! Tempura is a Japanese dish of seafood or vegetables that have been battered and deep fried. 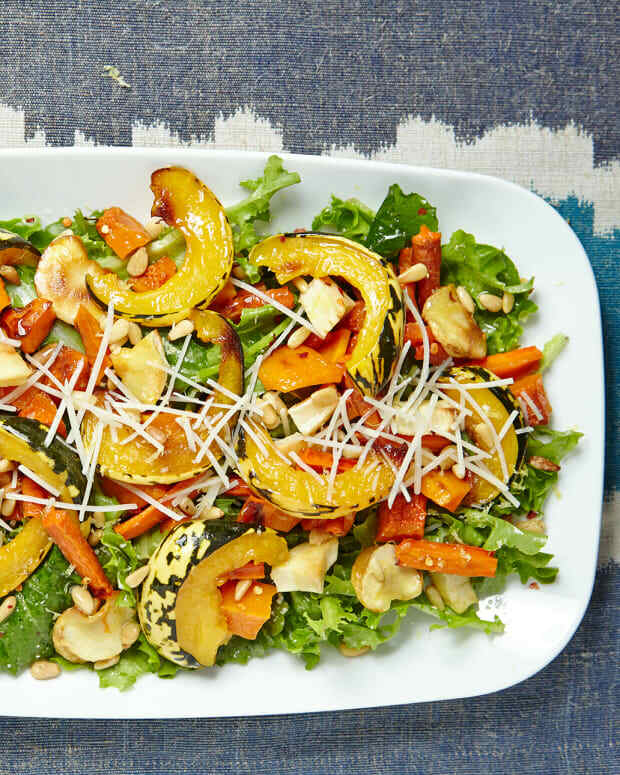 Lacy and crispy fried sweet potato tempura is a warm contrast to this cool salad. Tempura is best eaten right after frying. If done in advance, keep warm, uncovered in a low oven. 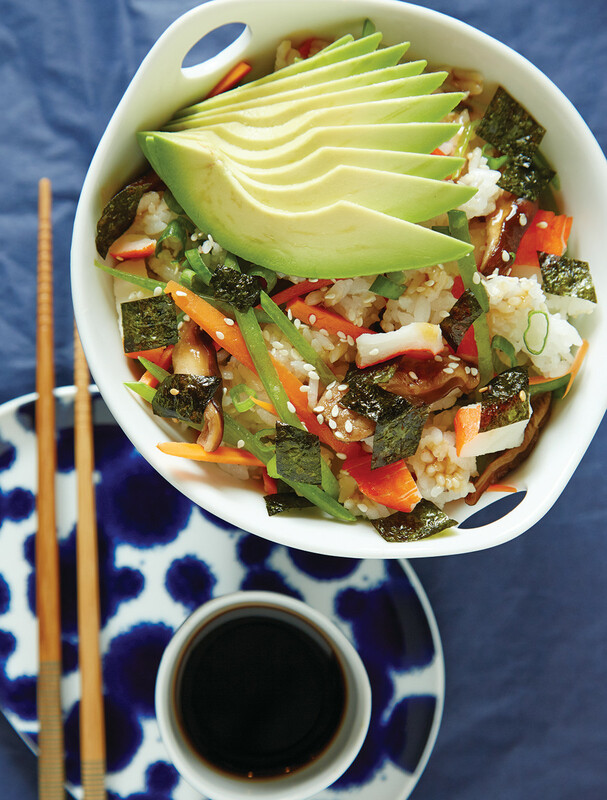 All the components of your favorite sushi rolls in one great salad. 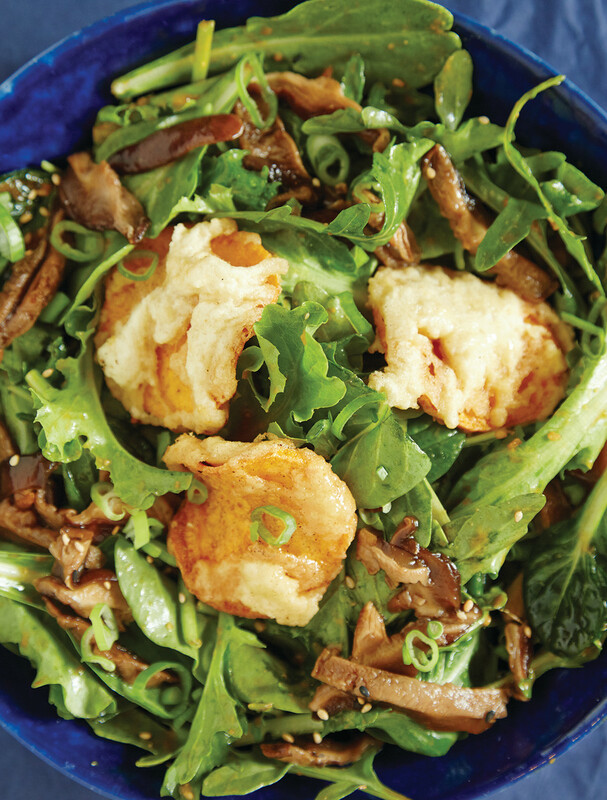 The shiitake mushrooms are briefly braised with soy and mirin to intensify their flavor. 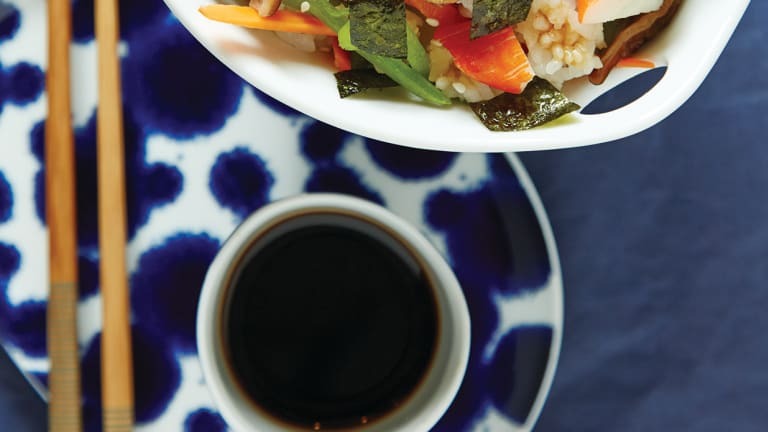 Add them to your favorite Asian dishes for a boost! 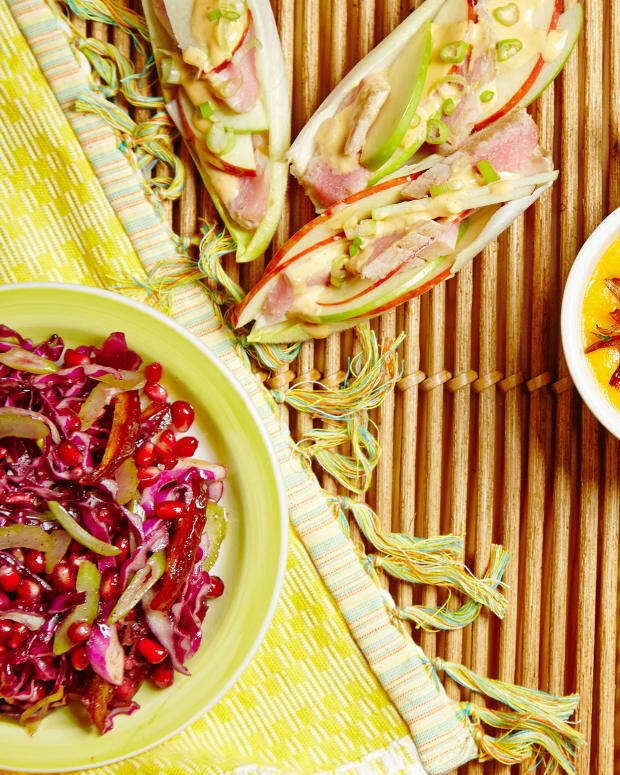 Serve as a fun appetizer or as a light lunch entrée. The toasted sesame nori are great as a topping or snack– these “crackers” can be made 2 days ahead and stored in a sealed container. Use scissors to cut to desired size. 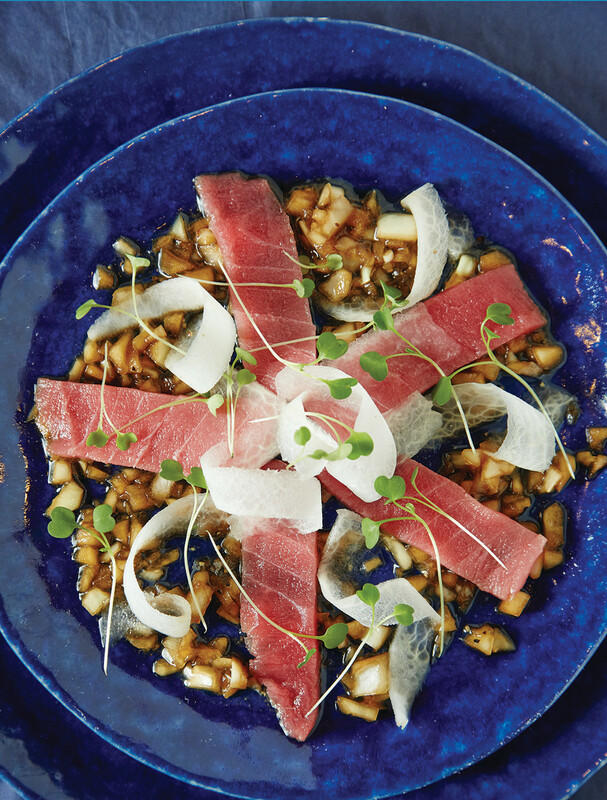 This Sashimi Salad recipe is perfect for any fish lover. 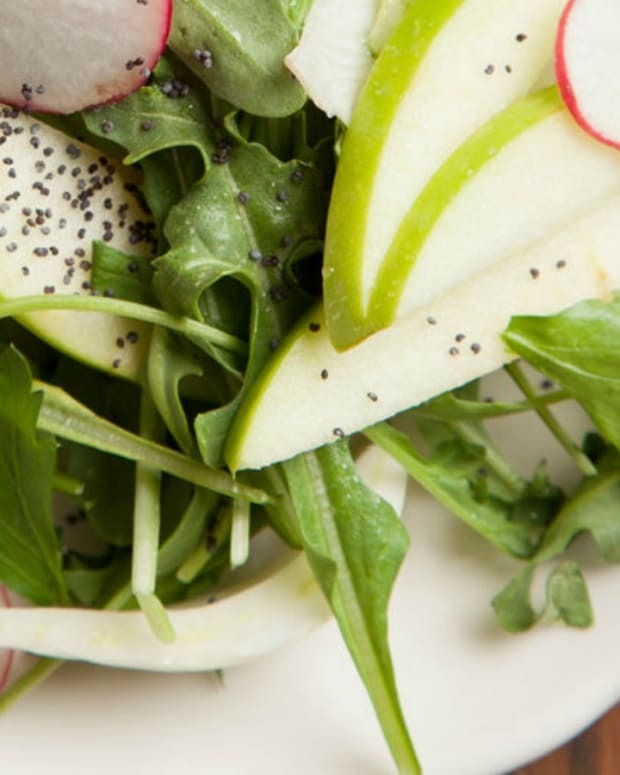 The vidalia soy dressing that is paired with it is out of this world. Inspired by Chef Nobu Matsuhisa, the excellence of this dish is largely dependent on the quality and freshness of the fish – the fresher the better. Rice is important in sushi. Really important. 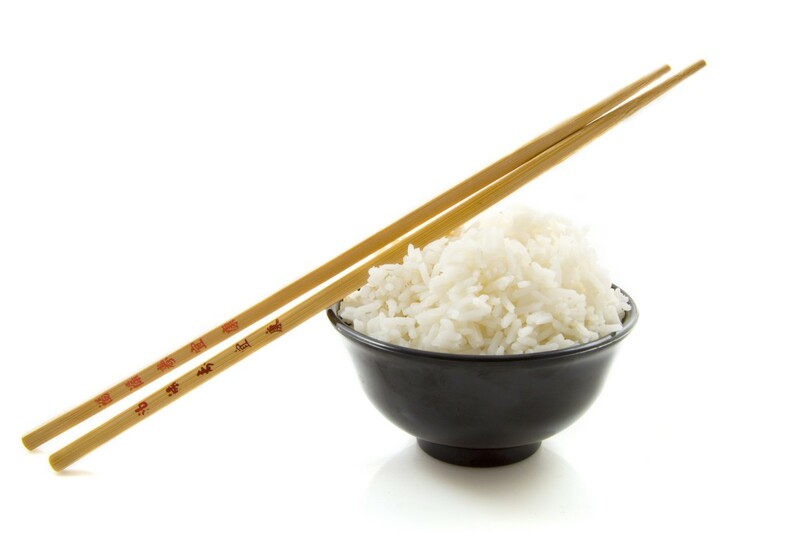 What makes sushi rice sticky is the extra glutinous quality inherent in this Japanese short-grain variety. And the sticky factor is what holds your sushi together...so use only sushi rice. Be sure to rinse your grains a few times until the water runs clear – besides cleaning the grains, you are rinsing away excess starch produced when the rice is milled. Sticky sushi rice is great, but gluey sushi rice...not so much.While a rice cooker is not a necessity, if you enjoy rice often and like to make sushi, a good rice cooker can be an invaluable investment. I recommend going with a Japanese rice cooker (like Zojirushi).